It is an unusual type of concretion which is formed when cracks appear in the concretion due to shrinkage. The cracks are later filled with crystals deposited from percolating water, here they are filled with calcite. Limonite occurs as a cement forming diagenetic mineral that precipitates from Fe-rich fluids. 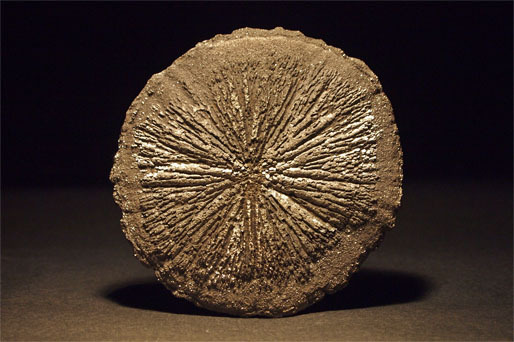 Resembling a fossil sand dollar (echinoid), this is a pyrite concretion in its natural radiating crystal form formed in the thin beds of black shale where the pyrite crystal grows outward in only two dimensions from the centre nucleus.